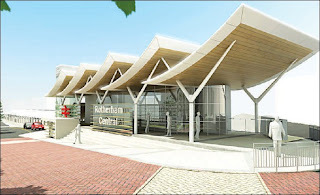 Coverage of the architectural designs for the significant upgrading of Rotherham Railway Station. Award winning international architectural practice Aedas has been chosen to prepare designs for the £2.5 million redevelopment. Incorporating a new passenger lounge, retail space and a travel information centre, the station is set to become a "dramatic and architecturally impressive gateway for visitors and daily users." Work on remodelling the station is expected to take place in 2009-2010 and will be the first phase of a four phase programme of improvements that will include lengthening the platforms, doubling the track access and providing lift access to the platforms. The improvements will upgrade links to the town centre and the catalyst for the redevelopment has been Yorkshire Forward's Urban Renaissance programme.